To successfully make money on termination, it is important not only to buy gateways and rent premises for equipment but also to choose the best tariff plans for SIM-cards. The cheaper outgoing calls are, the more money you can make. It is worth buying SIM-cards of major operators of the Republic of Chad, one of which is Millicom. 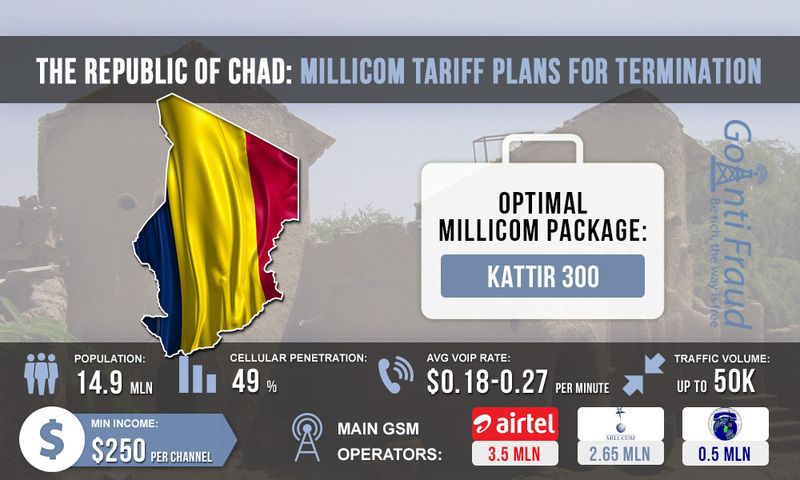 Millicom operates in Chad under the brand Tigo. The operator offers several types of SIM-cards at a different cost. Among them, there are standard, as well as nano and micro SIM. Conventional cards, which Tigo calls SIM Normal, are suitable for termination. It costs $1.7, while the subscriber immediately gets 87 cents to the account. They can be bought not only in Tigo's branded stores but also at various retail outlets and street vendors who do not require that you produce documents. The standard tariff for calls to Tigo numbers is $0.002 per second, that is, $0.12 per minute. Even if you terminate calls at this cost, you can make from $0.06 to $0.15 per minute. However, there are more advantageous offers from Tigo for prepaid subscribers. The best option is one of the Kattir packages, which include a different number of bonus minutes and SMS. It is most advantageous to connect Kattir 300, which provides 300 minutes for calls for a $20.78 subscription fee. Using this tariff plan, a minute of the call will cost as little as $0.06. If you terminating 300 minutes a day via Kattir 300, you can make over 650 dollars through 1 channel of the GoIP GSM gateway.